Bow Wow unveils the tracklisting for his upcoming mixtape "Greenlight 5", which finds an all-star lineup being featured. Bow Wow is going to be releasing his long awaited mixtape, Greenlight 5, here next month, and coming in today is the tracklist for the project. 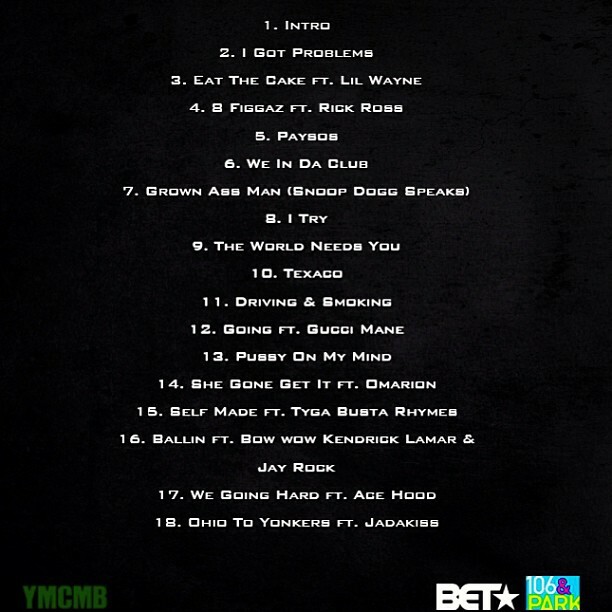 Bow Wow unveils the back cover art as a tracklisting for his upcoming mixtape Greenlight 5. The project finds itself featuring an all-star lineup with artists such as Lil Wayne, Rick Ross, Kendrick Lamar, Gucci Mane, Tyga, Jay Rock, Busta, Jadakiss, and more. It has been some time since we last received a Bow Wow project, but it looks like he's making up for that with this one. The 18-track mixtape is expected to drop on March 9th. Check out the back cover below. Travi$ Scott Insists "'Cruel Winter' Is Coming"